Five years ago, HopBox founder Michael Langone tried his hand at home brewing. As much as he enjoyed the process and the tasty results, Michael found himself scratching his head at how many plastic buckets and unattractive brewing tools it required. With a background in architecture and woodworking, he knew there had to be a better way. Before long, Michael turned his hobby into a business and created HopBox—small-batch home-brew kits handmade from reclaimed wood and locally-sourced pine in the USA. With HopBox, making your own beer is as easy as can be. The kits are designed to fit in small spaces and make a striking statement on any kitchen counter or tabletop. In keeping with the rustic roots of home brewing—no two HopBox kits are exactly alike and each one is hand-numbered. Every kit includes step-by-step written instructions, simple diagrams, a brewers' log, and more than 25 tasty recipes to try. 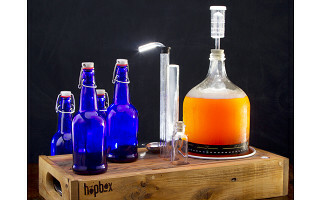 HopBox is available in a compact, portable one-gallon kit (with or without cobalt blue flip-top bottles), as well as a two and three-gallon option. Carry your home brewed beer in style with the HopBox Wood Caddy to share with friends or better yet give it as a gift. Cheers to the best new brewer in town. Michael from HopBox here. I've been home-brewing for about 5 years now and love the artistry and rustic connection you get from crafting each and every brew. Our kits are designed to make home-brewing easy and approachable for someone who hasn't done it before, and also veteran brewers who have been doing it for years. Hope you like them and happy to answer any questions you have! @Todd Hi Todd, our most popular kit brews 1 gallon of beer (about 10-12 average-sized beers), and our larger kits can brew up to 3 gallons at a time. The process takes about 2 weeks, but often less! Will this work for making hard cider? @Dennis I like your style. It absolutely will - one of my favorite things to brew with this setup! Can this kit be used to make Mead? @Catherine It sure can. Our kits work very well for mead, which tends to be brewed in smaller batches! What size are the individual (blue) bottles? Would 8 bottles be adequate for the 1 gallon? @Guest Each flip-top bottle holds 16 oz., so we include 8 just in case, but odds are that you're more likely to fill about 7 bottles when you bottle a gallon of beer. Do you have a kit for sale that has a 1 gallon bottle and 8 flip top bottles? @Amanda After a lot of consideration, we felt it was best to offer the 1 gallon kit as a standalone model - however, the Brew Caddy (which includes 8 cobalt blue bottles) and the 1 gallon kit make for a great pair! Do you think this would work in warm environments? Like Hawaii? 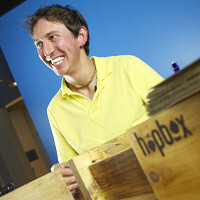 Five years ago, HopBox founder Michael Langone tried his hand at home brewing. As much as he enjoyed the process and the tasty results, Michael found himself scratching his head at how many plastic buckets and unattractive brewing tools it required. With a background in architecture and woodworking, he knew there had to be a better way. Before long, Michael turned his hobby into a business and created HopBox—small-batch home-brew kits handmade from reclaimed wood and locally-sourced pine in the USA. 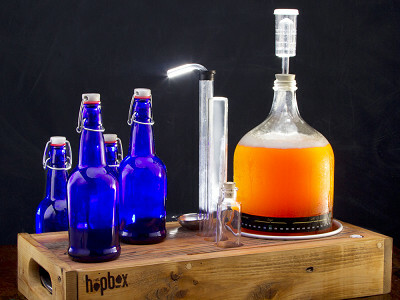 With HopBox, making your own beer is as easy as can be. The kits are designed to fit in small spaces and make a striking statement on any kitchen counter or tabletop.